This time of year, your average ate-too-many-holiday-cookies Joes and Janes aren’t the only ones making resolutions to improve their health. Health professionals make resolutions for the new year, too. We asked UCLA Health doctors, nurses, dietitians, and other experts about their goals for 2017. At the top of their lists were resolutions about not just making better food choices, but also mindfulness, disconnecting from technology, and fostering connection with loved ones. Take a look. Perhaps you’ll find a new way to welcome the upcoming year. Read more books and read less Facebook. Make the effort to pick up the phone and call others, rather than text. Spend more quality time talking with my husband, and avoid the trap of sitting on the couch on our computers after the kids go to bed. Also, to hug and love my 12-year-old Labrador every day, since this could be our last year together. He’s always around, but he’s easy to forget with three little kids and a full-time job. Be the best father I can be for my two little girls. Spread the word that exercise is medicine. It’s one of the best lifestyle modifications for optimal health and well-being, including osteoporosis prevention and management. Take advantage of the beautiful Los Angeles weather and take my exercise routine outside (with sun protective clothing and sunscreen of course). Take walks around campus to enjoy the fresh air, and spread the word on free resources like the California Smoker’s Helpline for those who are trying to quit smoking. Prepare more meals for the week ahead of time on Sundays so I’m not stressing out at the last minute. I plan to use a new erase board on my fridge to write down meal ideas and groceries I need to buy – with a preference for produce from local farmers’ markets. I also want to try one new plant-based recipe every month. Eat a lower footprint diet – one that is lower in water use and carbon emissions. I already eat a low footprint, plant-based diet, but I want to continue to work even harder to lower it. I want to keep teaching others about the health and environmental benefits of plant-based diets as well! Eat more mindfully in 2017. Explore more culture in the city by visiting museums and seeking out music and art. Read three to four books that are not directly related to my profession. I also want to develop a new interest or hobby. Finish writing my book dispelling hyped-up health myths. I want to spread the message to patients that to a kidney transplant surgeon, the kidney is always pink. Your best match may be from someone of a different race or religion. Build a support network for living kidney donors. These amazing people have made a huge difference in the health of others. The kidney exchange program and minimally-invasive surgeries have made it possible for many healthy people to facilitate a kidney transplant for even the most complex patients with end-stage renal disease. 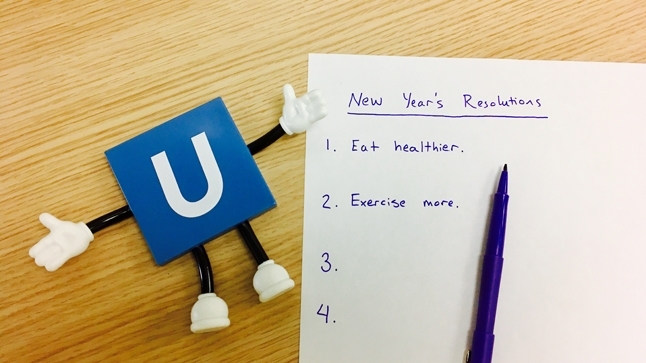 UCLA Health experts' resolutions are as diverse as the experts themselves. As we move forward into the New Year, let’s all resolve to do our part to make our community a healthier – and happier – place.